In the late 1930s, David A. Field attended the University of Illinois, where under the guidance of Dr. Hartley Price, he joined the men's competitive Gymnastic team (lettering in 1939 and 1940) as well as the original Gymkana Troupe that Dr. Price had founded at the University. "He directly participated in the carrying of supplies and equipment to forward areas where enemy interception and attack was probable and expected. He has accomplished his missions with distinction far beyond that normally expected in aerial flight." After the war, Mr. Field moved with his wife Barbara Jean, and daughter, Jean Ann, to Maryland where he had accepted a position as an instructor of Physical Education at the University of Maryland. Now, at last, he could start his own gymnastic team and Gymkana Troupe. In 1946, the invitations went out and the response of the students began. The University of Maryland Gymkana Troupe was a success from the start, quickly gaining notoriety and getting many invitations as the years passed, including invitations to perform for servicemen in bases outside the country. "There were few people who had had gymnastic experience in those days, so over at the Old Gym we started teaching forward rolls and backward rolls, cartwheels, knee drops on the trampoline, eventually somersaults on the trampoline and we worked ourselves up from there." The gymnastic team was also a success for the five years that it existed, even taking first place in the 1950 Southern Intercollegiate Gymnastics Championships on its first entry into the competition. Gymkana, to most of us, means a horseshow, when spelled with an "h" after the "k". I don’t think Dave had "horsing around" in mind when he named the Troupe, but this was after all a group of exhibitionists and of course there was a certain amount of horsing around. Dave was a wonderfully patient man and a great coach. 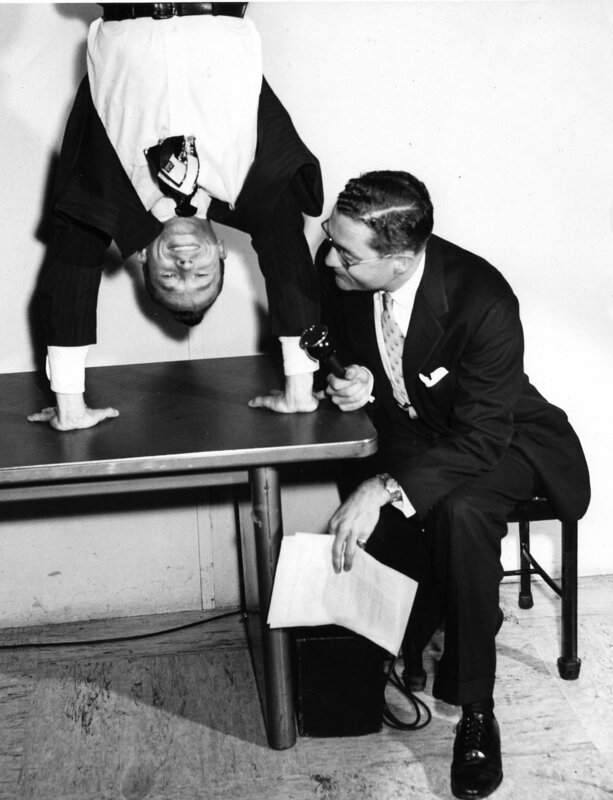 Dave was also a top flight gymnast having been on a national championship team while at the University of Illinois. While at Maryland doing graduate work he did something unique in the annals of Maryland athletics, one for the record books. An accomplishment which other coaches only dream of. In 1950 gymnastics was not a varsity sport at Maryland. There was no budget for same nor were there any inducements offered to bring gymnasts to the University. Dave none the less agreed to coach a bunch of guys from Gymkana who wanted to compete as a gym team. Despite the great demands on Dave’s own time, including studies for his Master’s degree, the Gymkana Troupe and its exhibition season, he formed a gym team made up largely of wanabees, many of whom had some gymnastic experience while others had little. Most were World War II G.I. Bill veterans. In those post- war days, Maryland was in the Southern Conference. Most coaches with a green, non-varsity club team would be delighted to be invited to a conference championship meet. Like Cinderella, Dave’s team was invited to the Ball for the first time in 1950. But win the Conference Championship? Dave thought so. So did his motley crew. The meet was held in Atlanta with the likes of Duke, North Carolina, Georgia Tech, and Georgia. Would I be telling this story if Dave’s team had lost? Of course Maryland became the Southern Conference Champions. I offer this vignette as a footnote to Dave’s remarkable career, something which brought him great satisfaction and pride. I would like to tell you that this was the beginning of an enduring program of men’s gymnastics teams at the University, but such is not the case. The team did not last past Dr. Field’s departure the following year when it finished second to Florida State, a national power at that time coached coincidentally by Dave’s old mentor at Illinois. But whether we won or lost, I can say that all of us on the team loved and revered Dave. He changed our lives. Through gymnastics, he gave all of us an opportunity to excel. And though the team did not last, Dave did leave a gymnastics legacy at the University of Maryland in the form of the Gymkana Troupe which has endured... the only one of its kind in the United States. And it all started with Dave teaching a group of students forward and backward rolls over in the Old Gym. In addition to these achievements, David A. Field went on to earn his doctorate in Physical Education during his years at the University of Maryland with a thesis entitled A Manual of Selected, Exhibitional, Gymnastic Activities, a subject on which he could claim quite a bit of expertise. In the summer of 1953, Dr. Field accepted a position at the Arnold College of Physical Education of the University of Bridgeport in Connecticut. There he started a Gymkana type group known as the Arnold Troupers. As the years went by, Dr. Field became even more involved in physical fitness and sports. "Different things motivate different people. For some, it's a book. For others, it's a newspaper clipping. For me, it was hearing a speech by a former professor, Dr. Thomas K. Cureton, Professor Emeritus of the University of Illinois. It seems like centuries ago. I was 46 years old and teaching at the University of Bridgeport in Connecticut. Cureton's remarks and his serious challenge to reactivate our bodies so stimulated me that by the end of the week, I was jogging 1/4 mile down my neighborhood road with my Welsh Terrier. "Within five years, I was failing in my first attempt to compete in the Boston Marathon. Within six years, I proved to myself that I could complete the Marathon." Throughout the rest of his academic career, Dr. Field remained active in the promotion of gymnastics and physical education, and maintained a vigorous athletic regimen for himself, including biking and weight lifting (he won a world championship in the 75 year old category in 1993) and badminton. He has even been known to do a little clowning around now and again. Dr. Field retired after a long teaching career while at Ball State University, as a professor emeritus. At Maryland, however, he will always be known, first and foremost, as the founder of the University of Maryland Gymkana Troupe. It is in tribute to his efforts in forming the University of Maryland Gymkana Troupe and his service to the group that the Best Trouper Awards would later come to be known as the "David A. Field Best Trouper Awards". In remembrance of Dave Field, founder of the University of Maryland Gymkana Troupe in 1946, from we who knew him then as our mentor and coach. Showman, innovator, improviser, organizer, promoter and tireless worker, Dave led his Troupe through its first six, formative years with performances for audiences throughout the Eastern Seaboard. A winner, Dave's Gymkana gymnastic team presented the UofM with a conference championship in 1950. Dave's constant pursuit of excellence inspired all who knew him. Multi-talented, Dave was also a WW II veteran, Air Force pilot- Pacific theater, an expert gymnast, professional acrobat, scholar, author and Ph.D. Dave had a lasting influence on all those of us who knew him 'when'. On this, the 60th anniversary of Gymkana, we dedicate this plaque to Dave whose Gymkana Troupe gave us some of the best days of our lives. His legacy continues for countless others- a sense of fun, a sense of humor, strong minds and bodies to carry through life. Thank you, Dave, for all that. You are fondly remembered.